This 10 year old lad is carrying 20 kilos of water – he has just walked half a mile with it from the local standpipe BUT it doesn’t have to be like this. On my first trip in 2005 I saw this time and time again but when I returned in 2006 I took some Rotary rollers with me BUT transporting them out has always been an issue. However with the support of the Westminster Group I was able to send 23 out by sea freight and whilst in Freetown I distributed them with Pastor Mark from Calvary School in Lunghi, a really good friend of mine. Rotary Rollers with their new owners whilst other children carry water the traditional way!! 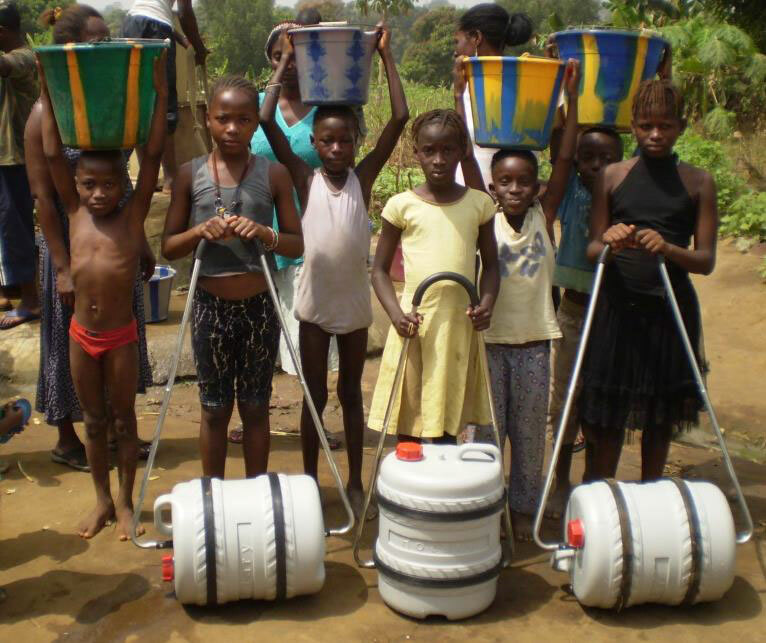 I hope to send many more Rotary Rollers out to Freetown in the future to help improve the daily chore of children carrying water long distances. Thank you to Adrian at Roll Out The Barrel for donating the barrels & Westminster Group for all their support with the shipping of goods. Thank you so very much for your kind assistance in helping Enable the Children to get highly important equipment to Sierra Leone from the UK. We are highly grateful to you and Westminster for coordinating the packing, transportation and unloading of our equipment – we cannot thank you enough. The gaiters and stability boots that you brought to this country are used to help children to be able to stand up and walk, as well as preventing deformities. They are not possible to buy in this country, which is why we rely on donations from the UK to be able to continue our work effectively, and without your help to bring them here, we would still be struggling. Thank you for all the time and effort that you put into helping us. I would also like to extend my thanks to those that donated the filing cabinets, T-shirts, school clothes and baby clothes. We will use the filing cabinet to improve our administration system and the clothes will be given out to needy children as we go to visit them in their homes. 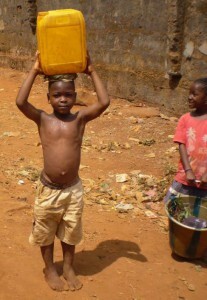 Thank you again for your continued support of Enable the Children, we could not do our work without you. I would like to say a HUGE thank you to Peter Fowler of Westminster Group PLC for sponsorship of the trip and to the Westminster Aviation Security Services team in Freetown for ALL their support and hospitality during my stay. Westminster Group PLC once again allowed me free shipment of goods on a container. I sent 10 x 4 drawer steel cabinets, 2 multi drawer cabinets, 50 stacking chairs and 100 boxes of aid! My first day in Freetown was spent unloading everything and taking it to Calvary School for sorting and distribution to 7 communities that I support. Contact Alan Wolstencroft for more information. 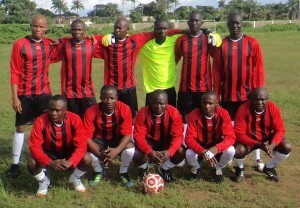 As a “thank you” to Westminster Group for all their help with the shipment of goods to Sierra Leone Alan Wolstencroft donated a football kit to the staff team. The latest sea freight container is being loaded with some furniture and nearly 100 boxes of school uniform, sports kits, corporate clothing, knitted items and books for distribution in 5 communities. Today a container will arrive at Westminster’s HQ in Banbury and once again they have agreed to designate some space for Goodwill & Growth For Africa UK to ship items of aid to communities in Freetown. A really BIG THANK YOU to everyone who has donated. Joanne Fowler, Westminster Aviation Security Services (left) met up with Anna Vines from Enable The Children to hand over a batch of stability boots which will assist the work that they are doing with disabled children in Freetown. Many thanks to Joanne for taking these much needed boots out to Freetown. Once again Westminster Group PLC offered GAGA UK space, free of charge, in their sea freight container and Alan would like to thank them for this wonderful ongoing support. Alan would also like to thank them for sending Brian in their van to collect the 60 Rotary rollers from Mansfield. With the help of Angela, Peter, & Michael, Alan loaded 37 boxes of school uniform, kids clothing, school stationery and books, 2 sewing machines, 60 Rotary Rollers, and 60 plastic stacking chairs. These donations will benefit the Lungi, Waterloo and Christian Hope School communities. 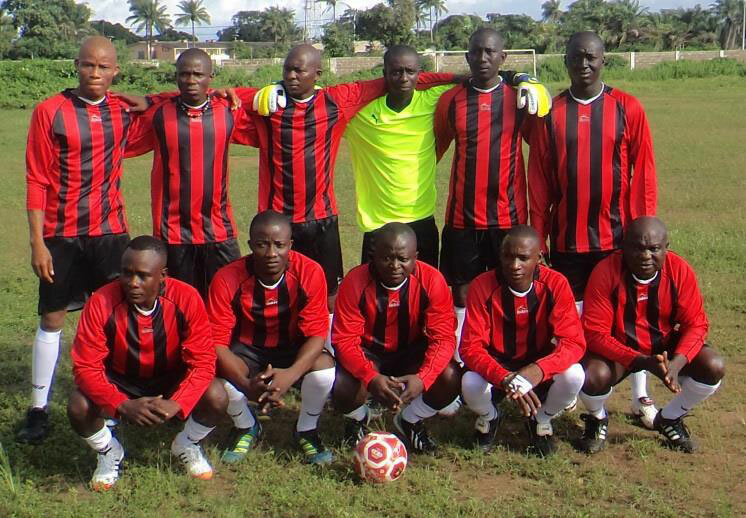 The sea freight container has been collected from Banbury and should arrive in Freetown in early June. The donated goods occupied 50% of the container – a BIG thank you to everyone at Westminster Group PLC for their sponsorship and support.